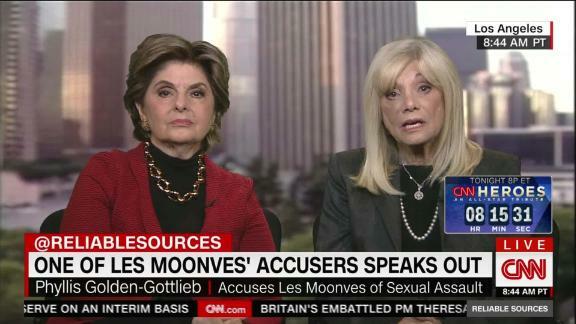 Gloria Allred and her client Phyllis Golden-Gottlieb, who accused former CBS CEO Les Moonves of sexual assault and harassment, talk with Brian Stelter about the ongoing investigations into CBS. While CBS faces a decision about whether to pay Moonves $120 million in severance, Allred says victims should be compensated. Moonves has denied the allegations. The two law firms that are investigating misconduct at CBS are due to deliver their report to the company's board of directors soon. The New York Times has already been publishing damning details from a draft of the report. But the investigation hasn't wrapped up yet, according to attorney Gloria Allred, who is representing four women who have accused former CBS CEO Les Moonves of sexual harassment and other inappropriate behavior. Three of the women have been interviewed by the lawyers, Allred said, and the fourth accuser is scheduled to be interviewed on Tuesday. That's the same day as the CBS annual meeting. Shareholders and other observers will be watching to see if the company makes any announcements about the investigation. The company is coming up on two deadlines that involve Moonves. The first, this Friday, is a self-imposed deadline to decide how to disburse $20 million in grants. The money will support "organizations that are helping to ensure safety and equity in our industry, as well as providing both prevention and assistance for victims of sexual assault, abuse and harassment in all workplaces," acting CEO Joe Ianniello said in October. The $20 million commitment was announced on the same day that Moonves was forced out. He led CBS for two decades, but lost a corporate tug of war with controlling shareholder Shari Redstone and lost the confidence of the board of directors following two New Yorker stories about alleged sexual misconduct. Moonves denied having any nonconsensual sexual encounters. But more than a dozen women came forward with accounts of sexual assault, harassment and other behavior spanning several decades. According to recent reporting by The Times, the two law firms hired by the board found evidence that Moonves tried to keep an accuser silent by arranging possible jobs for her at CBS. Moonves was required under the terms of his employment contract to cooperate fully with the probe by the law firms — Covington & Burling and Debevoise & Plimpton. But, the Times reported, he "destroyed evidence and misled investigators in an attempt to preserve his reputation and save a lucrative severance deal," according to a draft of the lawyers' report. That information will inform the CBS board's decision about whether to pay Moonves $120 million in severance. The money was set aside for him when he stepped down under pressure in September. But if the board determines that Moonves was fired "for cause" — and the lawyers' draft report apparently says there were ample reasons to do so — then the funds could be returned to CBS. The board is expected to make a determination about the severance by the end of January. A lawyer for Moonves did not offer a response to specific allegations in the Times, but told the newspaper that Moonves "cooperated extensively and fully with investigators." The law firms found evidence to the contrary. The Times only saw a draft of the report, so it could change before the full board of directors reads it. CNN has not reviewed the draft report. A spokesman for the board said Sunday night that he had no new information to share about when the board will receive the report. "I hope that this report will be made public," Allred said on CNN's "Reliable Sources" on Sunday. "But I also hope that CBS will do more than perhaps just donate millions of dollars to organizations. They need to be accountable to the persons who can prove that they are victims. If they can prove it, they need to compensate the victims, because they should not just be a footnote in all of this." One of the accusers represented by Allred, Phyllis Golden-Gottlieb, also spoke out on "Reliable Sources." Golden-Gottlieb said Moonves sexually and physically assaulted and harassed her in the 1980s. She alleged that Moonves did it because "they can get away with this. That's why." She said Moonves ultimately ruined her career at a time when markedly fewer women worked in the entertainment industry. "When I would not go along with his games," she said, her office was relocated "into, like, the cellar." She said he "made it very clear that I couldn't stay there." Golden-Gottlieb said the lawyers who interviewed her were "fair" and "asked the right questions." Notably, Moonves did not yet work for CBS at the time of the alleged behavior, indicating a thorough investigation by the law firms. Allred agreed that the investigators "were being very fair, very professional, and very sensitive to the women." She urged "anyone who alleges that she has information about Mr. Moonves, positive or negative, about sexual harassment conduct, if that occurred, to right now contact CBS, and let's have a full and transparent report." "That's a good idea," Golden-Gottlieb added.